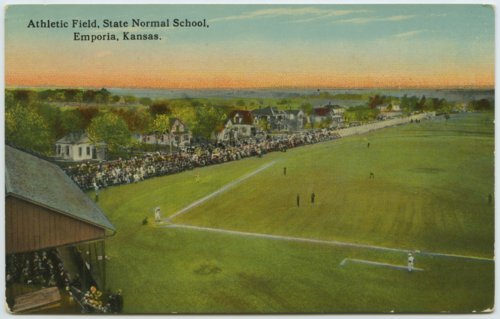 This color postcard, entitled "Athletic Field, State Normal School, Emporia, Kansas," depicts a birds-eye view of a baseball game in progress at the school. The image includes the baseball field and players, fans in the grandstand and bleachers, and the surrounding neighborhood. The State Normal School was the predecessor of Emporia State University.